TORONTO â€” Former President Bill Clinton really misses the presidency. â€œAll of a sudden nobody plays a song,â€� he told an audience here on Friday, referring to â€œHail to the Chief,â€� the anthem played at presidential events. When Mr. Bush, in response to a question from Mr. McKenna â€” who shared his question topics with the former presidents beforehand â€” defended his policy toward the Darfur region of Sudan, Mr. Clinton got his back, in return. â€œI think he did about all he could do,â€� he said. Mr. Bush said, with a hint of irritation, â€œI donâ€™t buy the premise that our attention was distracted,â€� a rejection of the argument that the Iraq war came at the expense of progress in Afghanistan. Neither war was popular with the hundreds of protesters outside the center, though most of their vitriol was directed at Mr. Bush. 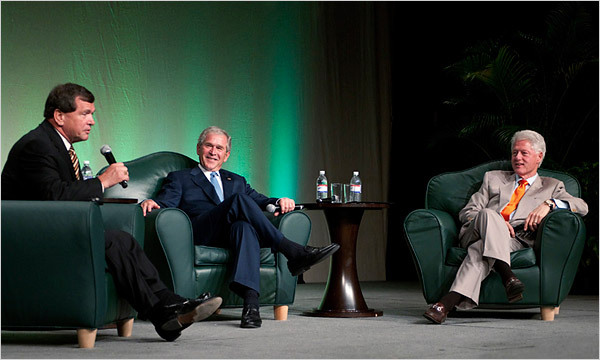 Indeed, though rarely reported upon, relations between the two men had begun to thaw significantly midway through Mr. Bushâ€™s second term, after Mr. Bush teamed up Mr. Clinton and his father, the first President George Bush, on relief efforts after the tsunami in Asia and then, Hurricane Katrina. Aides to Mr. Bush said he warmed to Mr. Clinton as his predecessor formed an affectionate bond with his father. I knew this was going to be the outcome of the event, I just didn't know how grossly appalling it would be. I would love to have been the moderator of that event... God would the outcome have been different! Re: Bush & Clinton Visit Toronto to talk at the Cost of 150K per Scumbag! This time, it's JUNIOR, *not* SENIOR - this says ALOT! Re: Bush & Clinton Visit Toronto to talk at the Cost of $150K per Scumbag! I forgot to add that into my little add-on notes next to sentences up there!!!! There were just so many gems up there... what a big freakin joke... this was nothing more than a psyop when you really think about it. Cocaine (benzoylmethyl ecgonine) is a crystalline tropane alkaloid that is obtained from the leaves of the coca plant. The name comes from "coca" in addition to the alkaloid suffix -ine, forming cocaine. It is both a stimulant of the central nervous system and an appetite suppressant. Specifically, it is a dopamine reuptake inhibitor, a norepinephrine reuptake inhibitor and a serotonin reuptake inhibitor, which mediates functionality of such as an exogenous DAT ligand. Because of the way it affects the mesolimbic reward pathway, cocaine is addictive. And this pertains to the thread exactly, how? This is why people like me are labeled a "crazy conspiracy theorist" (among other reasons)! I understand that Arkansas among other places was used by Bush/Clinton as a coke hub of sorts for their operation. I know they run/ran a coke operation... however, I haven't found any evidence to support your claim. If you have some, I'd love to see it, because that's huge!! If not... let's stick to the facts, ok?